What do you do when your industry has been completely disrupted by the sharing economy? One of IBM's clients, the Hotelier Group*, was an established hotel chain that sought to win back travelers it had steadily been losing over time due to competition. IBM had an internal hackathon where teams were encouraged to ideate solutions. As the lead designer on my team, I created a hotel loyalty experience to provide a seamless transition between the digital world and the real one for modern travelers. How do you redesign the hotel loyalty program to attract Millennials? How do you redirect digitally-native guests back to the hotel experience? In our research, we learned that there are a variety of travelers. By creating empathy maps and scenario maps, as well as surveying over 140 people, we were able to pinpoint three main travelers. After that, we were able to make an informed decision about the type of user who is most likely to use Hotelier. The main persona we wanted to focus on was "Jill" - the type of explorer who is typically a younger digital native, influenced by social media, and pretty price conscious. She's the type that goes for Airbnbs, telling herself that while she knows they aren't as safe or convenient as hotels, they are more affordable and allow her to really mingle with the locals. Sheldon is your typical, high-earning, business traveler who expects and prioritizes his comfort and convenience. Price is not a big factor to him (especially not if he bills it to his company). He's not necessarily traveling to meet locals or get immersed into the nitty gritty details around him. He's more interested in having a nice place to relax and wind down after a long day of meetings on meetings. Kshithij (pronounced shih-thij) is our friendly, low-budget traveler. He's ballin' on a budget and is willing to deal with some pesky inconveniences in order to save money. You'll find him mainly in hostels and on public transportation (or foot). He's interested in meeting locals as well, but he's a bit different from Jill in that any social media influence he's received is moderated by his concern about price. We surveyed 146 people and asked them questions about their travel preferences and current customer journeys. We asked the participants in our survey to rank the following travel factors by importance: cost, safety, amenities, and location. The graph depicts the average of the ranked scores for those factors; the higher the score, the more important it is to our sponsor users. We mapped out the customer experience of booking and going on a trip with the current technologies at hand. We then dove into the different pain points during each phase of travel. This depicts where the pain points pile up during the journey. One of the key goals we had for this product was creating an easy way for users to identify and book activities that were affiliated or recommended through Hotelier. This would allow users to see the value in booking through Hotelier and staying in Hotelier establishments. We iterated and refined the user flow multiple times and incorporated gamification to make it more rewarding for the user. Opportunity: How do you create a platform that is so indispensable for travelers that it would be an inconvenience for them not to use it? Solution: Allow users to complete all stages of their customer experience journey through the app in a seamless fashion and give them a way to rack up points in order to save money on future trips. Travelers often have to research and book on multiple sites (Airbnb, Expedia, TripAdvisor, etc.) - it would be much easier if all of that was consolidated into one, unified platform. Opportunity: How do you create a rewards incentive that encourages travelers to stay at Hotelier locations and use the Hotelier platform continuously? Solution: "Gamify" the experience and reward them points for attending special, authentic events that are only accessible if they have booked a trip through Hotelier. Opportunity: How do you create an inherent drive for users to start gravitating towards the Hotelier experience? Solution: Give users the option of integrating their social media accounts in order to not only facilitate ease of travel, but also propel social impetus; this provides momentum for the people in their network to pick up the platform as well. Integrating other accounts will also make this platform much easier to pick up and adopt. Click around to explore the app below! 1. Functionality Expansion: Moving forward, we would love to see the design and development of the "Book a Trip" tool in our app. This was not a priority for our pitch event, but we think that including such a functionality in the platform can be instrumental for business success. After all, a lot of Jill's difficulties in her customer experience popped up during the planning and booking phase. 2. Back-end Integration: With Hotelier's omni-channel experience, it is key that our mobile product is able to fully connect and integrate with existing back-end resources. Ideally, our developers would have worked on the back-end in tandem with the front-end work, but given the time limitations of the event, we had to pursue the latter solely. 3. User Testing: An extremely important next step for us would be to actually get users in front of the product. We would want to see which features they used or didn't use, and if there were any features that were particularly difficult to access or use. We were particularly interested in seeing if the gamification aspect that we incorporated into the product was relevant and useful. 1. Have a Dream Team. And then apply Agile. Our Dream Team was made up of some really dope designers, developers, researchers, marketers, and an unwavering product manager! By implementing the Agile process, we were able to quickly iterate and ideate for our client's problem. 2. Storytelling is key. When pitching our product, we wanted to allow our audience to empathize with our sponsor users. 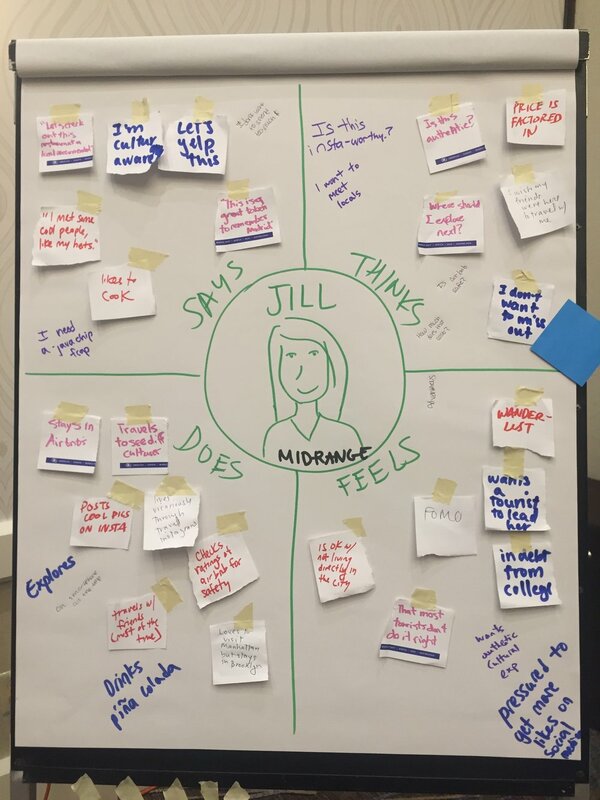 We showed Jill's struggles while traveling, and then walked them through our product demo, highlighting how each feature addressed her various pain points.